The longer you go without posting the harder it is to come back, so I’ll make this quick and easy. The #We35 Photo Frontier assignment was to shoot 36 photos as if on a roll of filmcreate a contact sheet, and to pick one selection. 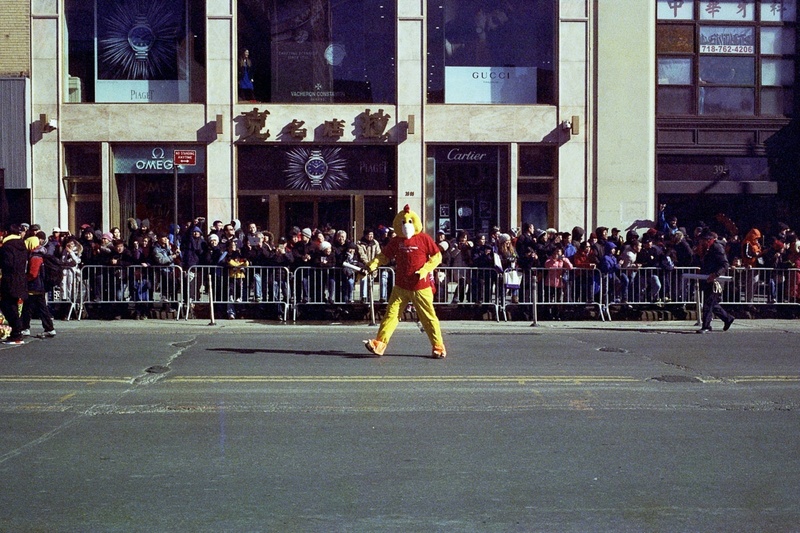 I used an actual roll of film and shot at the Chinese New Year parade in Flushing Queens. knew a parade offered both advantages and limitations to the project. On the plus side I had a guaranteed stream of potential subjects walking by, and the format meant I had to really use quick judgment on whether to shoot any particular subject. I did not want to either have the parade end with shots untaken, nor to finish the roll 50-70% of the way through the parade. But I had little chance to work on composition or to really stop and think about what I was shooting, why, and how best to showcase it. But I was happy with those trade-offs. With no zoom and a slightly wide FOV, my single hoped-for goal was to get a few shots of puppet dragons close-up as I knew they would wind across the whole street and come close enough to get some decent framing. And I managed that. But I chose this because, well, it just seemed like a well-timed moment.